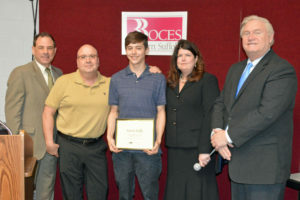 Five Wilson Tech students were honored by the Board of Education of Western Suffolk BOCES at its annual Recognition of Outstanding Students program, which was held in conjunction with the May 8 board meeting. Julia Gabrell of West Babylon, a second-year student in the Advertising/Graphic Design Program at the Wilson Tech Dix Hills Campus. Julia serves as the AM President of SkillsUSA, the student leadership organization for Wilson Tech, and is also part of the Compassion Without Borders team. 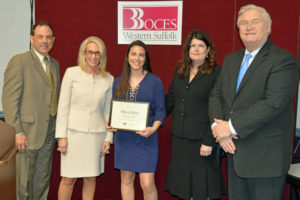 This year, Julia was selected to receive the Suffolk County High School Principals Association Leadership Award. Upon graduation, Julia will attend Farmingdale University. Djamilie Jules of Wyandanch, a student in the Criminal Justice Program at Wilson Tech Republic. Djamilie is a member of Junior ROTC, took part in the Town of Babylon UJIMA internship program and is a SkillsUSA member and officer. She is a scholar with a 90-plus average at Wilson Tech and her home school. 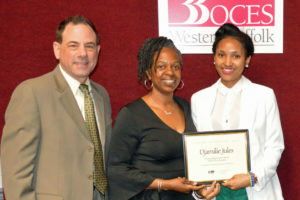 She plans to study political science and computer science at Stony Brook University. Kevin Kelly of Harborfields, a student in Construction Electricity at Wilson Tech Dix Hills. As a competitor in the SkillsUSA contests, Kevin placed first on Long Island and in New York State in the Industrial Motor Control Competition. Later this month June, Kevin will travel to Louisville, KY for the National SkillsUSA Competition. Kevin maintains excellent grades plans to apply for an apprenticeship in the electrical union. Mateusz Mojsa of Commack, an Automotive Technology student at Wilson Tech Northport. Mateusz’s top-notch skills were showcased in the Greater NY Automobile Dealers Association Competition as well as the SkillsUSA regional and state competitions. 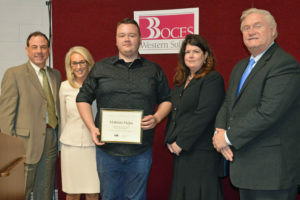 Matt passed the ASE MLR Certification exam and was selected to participate in the Automotive YES work-study program enabling him to work with a master technician at Paul’s Rods and Restos. 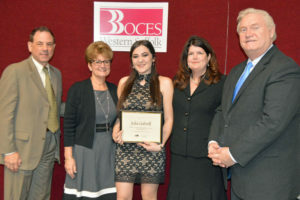 Alexa Peters of Smithtown, a student in the Cosmetology program at Wilson Tech Northport. Alexa was inducted into the National Technical Honor Society and is a SkillsUSA Officer. She earned first place in the regional SkillsUSA Job Interview Leadership competition. She maintains her grades and has near perfect attendance.